This month we continue our series of firsts, telling the tales of Zookers conquering their own fears and trying something new. Many of you have already met Laurie Graham while registering for any of the recent Zooki-Melt events. This year Laurie decided to leave her perch at the front desk for a little while and do something a little different. As is the tradition with the Seasoned Rookie interviews, I flew out to Indiana and picked up Laurie in the IZOOK helicopter. We had the following conversation in a local seedy bar with the obligatory 80s cover band in the background. Rookie Laurie, why dont we start with you telling us a little about yourself. Who are you? Laurie This is a tough one (laughs.) I think the best thing to say is that I am a result of that which surrounds me. I am a friend, a mother to one daughter, and a full time office worker for a manufactured housing company. Im also a wife; Im married to TD Graham for 13 years now. I enjoy playing piano, riding motorcycles with my husband, reading, and writing with family and friends. I guess that makes me a busy, patient, slightly creative and a little bit crazy social ladybug! Rookie How long have you been in the Zookin community? Laurie TD and I got into it at around the same time. I remember going to Attica for a weekend, staying overnight at my brother in laws apartment in Lafayette (no camping for me!) and wheeling during the day. I still remember when TDs Zook was pretty much a stock Samurai! Now THAT is a long time ago! Im sure I started doing it because he liked it, and I enjoyed the people we wheeled with, so he didnt have to ask twice whether or not Id want to go along!Rookie So youre a veteran member then. Have you been to previous Melts? Laurie I think Ive attended all of them. TD pretty much put me to work right away, so Ive helped out at the registration table, mostly selling t-shirts, sitting in the sun, and smiling a lot, but mostly just when things were running smoothly. Rookie Now, about this years ZookiMelt I understand that this time around you tried something you had never done before. Care to share your tale? What inspired you to take the plunge? Laurie You know, I cant believe I even did this. I am not someone who takes risks! I can be spontaneous, but as far as risky I talk myself out of doing everything. Laurie (rolling eyes) anyway, you came up to me and suggested that I join you and your friends John and Brandy for an instant trail ride. 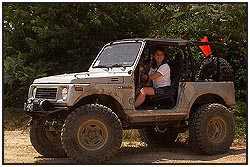 I couldnt believe it when TD gave me permission to take his Mazuki on the trails. I had never intended to drive Mazuki (given its name since this Suzuki is powered by a Mazda Rotary engine,) since its so quirky and I was unsure of myself. Anyway, for some reason I felt the urge when you offered, and with TDs blessing I took the keys and ran! Laurie Well, I was just so nervous at first. Gosh, do I even know how to start this thing??" I've always known how to drive a 5-speed, and over the years I've learned how to lock in the wheel hubs manually, but I know nothing about shifting upper and lower transfer case gears. So you see, I really didn't have much of a clue what I was doing! Rookie Well, I do have to say that your confidence had a great facade somehow I had the idea you were an old pro! Laurie That must mean I faked it well When YOU asked me to go on a trail run you must've thought that I could at least handle it. And I think that I did. Rookie If I remember correctly John rode with me, and Brandy hopped into your truck. Laurie Thats right it was sort of like a double-rookie-date! Anyway, our guide (that would be you, Murph) was kind enough to take us on to the blue trail! It was great there were steep and narrow ditches, some wobbly ruts where our new friend John was kind enough to help direct me through, then up and down steep hills (some with trees in the way) where again, John said "don't worry about it - with what you're driving, there'll be no problem". Of course, I knew that the Mazuki could and has gone many places. I, on the other hand, had not driven it in these places and so I was worried more about driver error. Rookie That seems about right I remember John would hop out and spot you up, down, and over obstacles to help you along, and then we switched places for a while. You did great! Laurie I really was having a good time. 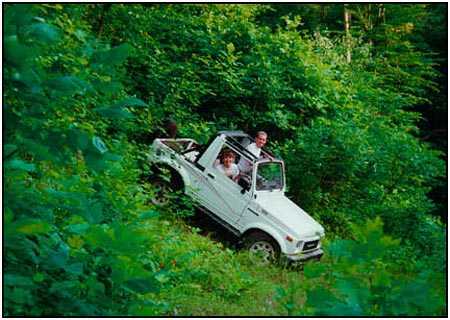 My passenger, Brandy, was a four-wheeling first-timer, and so whatever I decided NOT to do was just fine with Her. Every time we'd get through something we thought was difficult, she and I would cheer "Oh my gosh, we did it! I was so scared! This is so fun!" Rookie Would you say that your experience as a dedicated passenger for all those years helped you through your first time out? Laurie (laughing) Thats right you decided to zoom out and make a large splash, so we spent the next fifteen minutes trying to get your truck started again. 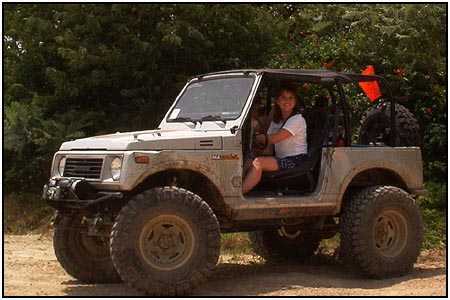 Jeff (the other trail leader) jumped up and down on your front bumper and somehow that made it start! Laurie Yeah right, Murph! Anyway, after the drainage tubes, we headed out to the dunes to play around on our own. At this point I had built up my confidence enough I felt I could drive anywhere so I checked out a steep sand dune. The gears in Mazuki were so low that I had to push the gas a little to keep it from almost stopping!